The Venus flytrap: shows reaction to the second touch. grow in soil that has little nitrogen. They get nitrogen from the insects they trap. This nitrogen is used to make intravenous food like proteins and fats. The Venus flytrap is one of a very small group of plants that can snap shut very quickly. When an insect or spider crawls along the leaves and touches a hair, the trap closes only if a different hair is touched within twenty seconds of the first touch. The two-touch trigger means that little energy is wasted on things that are not food. 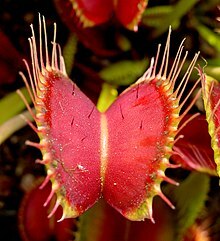 The Venus flytrap feeds on insects, such as ants, beetles, woodlice, worms, flies, grasshoppers, and moths. First it traps the insect inside its leaves, and then lets out a liquid that helps digest the trapped animal. The plant consumes the insect and takes the nitrogen from the insect's body. The Venus flytrap makes sugar by photosynthesis. The insects give it nutrients which it cannot get from the waterlogged soil. With the nutrients it can build up enzymes and other molecules which need trace elements as well as sugars and amino acids. Venus flytraps were first discovered in North America on the coast of North and South Carolina, where it grows wild near the Cape Fear River. However, people anywhere can grow Venus flytraps in pots. Venus flytraps in pots need water and soil without calcium or nitrogen in it. It is named after the Roman goddess of love, Venus. ↑ Slack A (1988). Carnivorous plants. London: Alphabooks. pp. 18–19. ISBN ISBN 0-7136-3079-5 Check |isbn= value: invalid character (help). Wikispecies has information on: Dionaea muscipula. This page was last changed on 23 November 2018, at 03:10.